The first schedule of Salman Khan's Dabangg 3 has just begun and you won't believe, the film has already found itself into legal trouble. Not long ago, the actor's film ran into a problem for covering a Shivling during his shoot in Madhya Pradesh and now the actor has been issued a notice by ASI - Archaeological Survey of India for damaging antiques. The actor's production team has been issued a notice by ASI asking them to remove two film set pieces constructed inside Jal Mahal in Mandu. According to reports, the notice was issued after the production team did not take any action after being informed about the given problem. The notice states that the film's team violated Ancient Monument and Archaeological Sites and Remains Act 1958, by constructing on a wrong location. Apart from this violation, the team has also apparently damaged an antique figurine during their shoot at Maheshwar town in Khargone district. 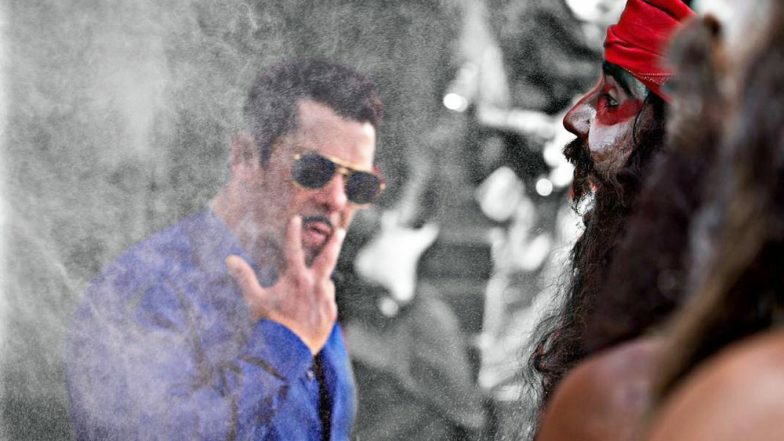 Salman Khan's Dabangg 3 in Controversy Over a 'Shivling', Actor Gives Clarification. Reports suggest that parts of the figurine broke on Sunday when the film's set was being removed from the location. The damage was done on account of heavy objects hitting the statue and breaking away a few pieces of it. The said fort has been known to be of historical relevance since it was built by Holkar rulers. Dabangg 3 Song Hud Hud Dabangg: Salman Khan Aka Chulbul Pandey Makes Us Say 'Friyay!' With This New Still – See Pic. MP Culture Minister Vijaylaxmi Sadho has stated that an action will be taken against those who are responsible for the incident. Let's see what Salman has to respond to this fresh legal trouble. Earlier, after the 'Shivling' controversy, Salman, hurt over the controversy, came in front of the media at Maheshwar to issue a clarification.